See the world from a fish's point of view! This window features a blue pane hand-sanded to fit it's wave-shaped frame. It's perfect for anyone with a beach house, or at least the desire to own a beach house. It's the perfect little table for the breakfast nook in everyone's house. The trademark marble tile in the center gives it an indescribable charm and appeal. The ergonomical design mixed with the not too expensive construction of this lightweight desk chair makes it a must-have in any home. Give any room the ambience that only a barrel can provide. Bring your living room back to the 50's with this classic piece. A wall suspended bookshelf designed for sims with a dark side. Use it to brush up on your mechanical skills, go through your old cookbooks, or just enjoy a good book. A new way to get creative! Composed of a grand total of 116 separate images (all hand forged) that make up fourteen sprites, this is my toughest object yet. Of course, the necessary animation data (16 files this time) are included. See the ReadMe file for instructions. Run yourself to health! 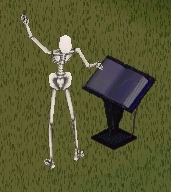 This little download has some new fitness equipment, as well as it's own animation data! See the ReadMe for instructions. Defies gravity while defying darkness! This model of technological wonder features a levitating bulb centered above it's attractive techno style base. A must-have for all you mad scientiests and retro buffs. Warning: Overexposure to GlowOrb Lamp's beams may cause permanent eye problems, radiation poisoning, or cancer. Do not approach while active. Get gothic with the GasTech corporation's most popular product! Research shows it to be up to 20% safer than it's "authentic" predecessor. Light the way with this new street lantern from GasTech. It combines their classic syle with a practical price. 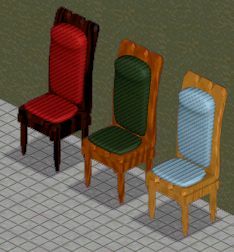 Are you a couple of low-income sims looking to cut corners at every opportunity? Well, have we got a product for you! Introducing the IntiMatic Toilet, the famous two-seater! Everyone knows it's cheaper to buy in bulk, and that's why we're able to offer this to you for the low, low price of §350! This FAR compiled set includes the round timer unit and the sprinkler units shown here. The timer waters the lot's plants every hour on the hour, and the units are merely cosmetic. Loneliness is a harsh illness, and this is the cure! 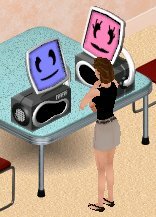 With the Chatter-Vox unit at your side, you'll never find yourself wishing you had someone to talk to again. Utilizing the cutting edge of voice recognition technology coupled with a breakthrough design in algorithm-driven computerized conversational phsychology, there's no subject too abstract for the Chatter-Vox to follow. Plus, there's not one, but TWO vocal output systems built in... one is male, the other is female. It's like getting two friends for the price of one! This decorative wall-hanging displays the correct hour in your choice of red, green or blue LED lettering and also serves as a fully-featured alarm clock that can be set for any time of day. The DigiDec wall unit offers you the very best in digital decoration. Gaze in awe as this technological wonder displays the current hour, every hour. Not exactly a clock... not exactly a wall hanging... it's the best of both worlds! All that PLUS a handy built-in alarm makes the DigiDec unit top-notch! Molded with only the finest quality plastic, the PoolMaster promises performance for the long-run. Watch in glee for hours on end as it scurries around your swimming pool adding that little bit of fun to wherever it zips along. Equipped with collision prevention sonar. Livin' Large Required! Feeling all alone in the world? Wish you had someone to talk to? Someone just like you? Well, happiness can be yours, but happiness comes with a price. With the Dualizer Cloning Ray, you can have a friend whenever you wish. Quick DNA evaluation process requires an unclothed scan. Then, step back and watch in amazement as your perfect double appears before your eyes. 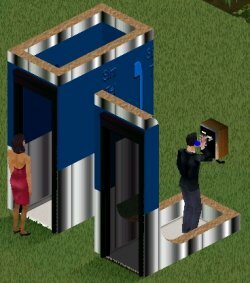 The Simtel phone booth is perfect for all of you out there who've gotten sick of friends who just drop by to use the phone. Zip file includes walls, telephone, and transparent black doors shown in picture. The Retro-Max seal of approval promises that this high-fidelity radio system will make your room look right out of the 50's, or at least sound like it. Constructed of sturdy oak. Persian, popular breed of longhaired cat. More Persians are registered with the Cat Fanciers' Association, the largest feline registering body in the United States, than any other breed of cat. Persians are aristocratic but by no means delicate, with long, plush coats and heavy bones. They have broad, massive skulls with round faces and a domed forehead; small rounded ears; and broad, snub noses with a decided break. The coat is long from head to tail, with an immense ruff and frills between the front legs. The Persian comes in a broad range of colors, with blue, black, and white being the most popular. "Persian," Microsoft® Encarta® Encyclopedia 99. © 1993-1998 Microsoft Corporation. Another public domain object for you, my visitors, as a gift. Recolors are quite welcome here. If you see fit, please drop me a line so I can see what you've done with it. 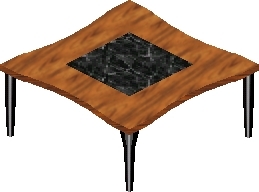 The Saturn Flytrap is a living, breathing, sentient plant life form that needs to be watered once per day and fed every other day. Like it's Venusian cousin, this large plant eats meat. 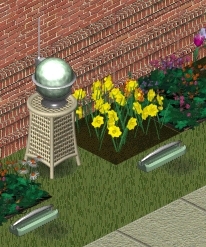 Not to worry, though, your sims are safe; this plant is only hungry for insects. So you can feel safe bringing this lovely specimen into your home, just don't forget to keep it fed and clean. As testament to my complete distaste for the ridiculous object war that seems to be going on right now, I'm offering the blue op as public domain. Recolor to your heart's content. I'm not requiring you to notify me, but please do so that I can admire your work. No creature is quite as mysterious as the Siamese. Bring this friendly but aloof creature into your home and share with it a bond that will last forever. Or, bring two into the house and start a new litter! Just don't forget to feed them. Ever wondered what life is like on the other side of the bathroom walls? Here's your chance to find out. 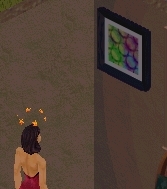 This painting makes male sims think they're female, and vice-versa. Note: This object works with all versions of the game, but you won't see the stars unless you have the Livin' Large expansion pack. Make a real statement with this wall-hanging decoration. We don't reccomend you keep it loaded. Give your lounge (or any room!) the grace and chivalry of the medievel ages with this wall-mounted broadsword. Decorate your wall with this handsomely displayed Simmington Special rifle. Looks wonderful in a trophy room. Smile on as your guests stare in envy at this shining gold key to the city. It's attractive display and clean polish make it a nice addition to any room it graces. This painting emphasizes the strong work ethic of the bees, and is a good moral guide for all who view it. A disturbing distortion of back-alley life for the social outcast. A tribute to the Terry Gilliam film, Brazil. Give your study a mysterious atmosphere. The Aqua-Magic SpellScroll is a fun little chant that will bring hours of enjoyment to the water enthusiast in your household. Each incantation brings more water. The more you cast, the bigger the puddle. Get the charge of your life! Something like that, anyhow... The Electro-Magic Spellbook is one of the most effective ways ever to get rid of unwanted friends or relatives. Messy fires can take too much time to finish sims off, and there's a good chance it'll go out before your enemy bites the dust. There is, however, not much arguing with 10,000 volts. Wanna quick way to kill off annoying sims? Is that the sort of thing that you get a kick out of? 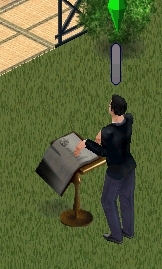 Well, it's easier than ever with this download... just have your sim "cast a spell" and watch it read a passage... and then go up in flames! Great for parties. 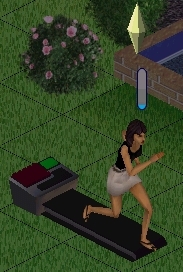 Morning Rain is a sim version of the fountain of youth. However, sims who drink it aren't effected externally, but internally; that is, they only act like children. Evening Rain works on the same principle; the difference is that it forwards a sim's age instead of reversing it. Replace that electric guitar with the real thing! Fire that fat purple wonder of a genie and replace him with a cute young lady! This file replaces in-game defaults. If later you wish to restore them, simply remove the files listed in the readme included with this zip. Wow! Decorate your lawn or garden with these sim-sized chess pieces! Check out the object description for each piece to see how it is played in a real chess game. The "V" chair is the latest in Virtuoso innovation. It changes wood type at the click of a button. Choose from Mahogany, Birch and Maple. In addition, the super-soft, comfy cushion self-updates to accommodate the aesthetic demands of the selection. Elegant, delicate design, brought to shimmering form by Virtuoso technology. This model shifts from a silver sheen to a gold luster to a shiny bronze finish. 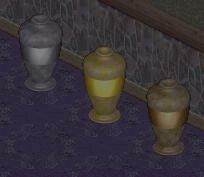 Using an enhanced version of Virtuoso technology, the Virtuoso Urn is now available! It changes from silver to gold to bronze, all at the click of your mouse! 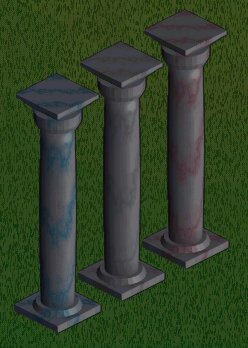 The virtuoso columns are a major breakthrough in color scheme technology. The picture shown here depicts not three, but one single object. For when the virtuoso column is clicked, the user is presented with the option of changing it's default white color to blue or red, and back again!